It is crucial that we employ strategies to better detect intermediate age-related macular degeneration so we can begin treatment sooner and preserve functional vision to, ultimately, help our patients maintain their quality of life. 644 patients aged 60 years and older with normal macular health according to their medical record were enrolled. The presence and types of AMD-associated lesions were noted. The investigators found that about 25% of eyes originally thought not to have AMD, based on dilated eye examination by a primary eye care physician, in fact did have macular characteristics that indicated AMD on fundus photography read by trained evaluators. Baseline visual acuity in AMD predicts visual acuity at 1 and 2 years; individuals who have poor vision at presentation never catch up to their counterparts. 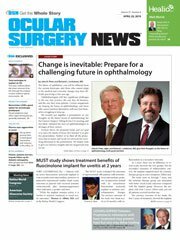 Clinical trials and real-world evidence confirm that only a small percentage of patients present with functional vision of 20/40 or greater at choroidal neovascularization (CNV) diagnosis. In fact, some suggest that on average 59 days (± 62) pass between initial symptoms and initiation of treatment, resulting in patients having lost 15 to 25 ETDRS letters at wet AMD diagnosis. These shocking statistics represent the need to improve our detection methods and highlight the critical necessity to catch this conversion to exudative AMD at the earliest possible moment. Amsler grid or artificial intelligence? We also know that when the Amsler grid is the only at-home monitoring tool, it has a limited ability to detect visual changes. In addition, there are challenges when it comes to the patients’ ability to accurately utilize the test. It has been shown to have low sensitivity as well as it can be substantially subjective from exam to exam and from patient to patient. According to some reports in the literature, Amsler grid interpretations have poor validity and are unreliable in the clinical diagnosis of retinal defects. Today, we can do better than relying on what amounts to a lined piece of paper to save our patients’ vision. ForeseeHome (FSH, Notal Vision) uses patented technology that incorporates both artificial intelligence (AI) and telemonitoring, thus allowing patients to test their vision from home and for us to monitor their vision remotely. Patients use the test daily, and their responses are wirelessly transmitted to a data monitoring center and are automatically analyzed by an algorithm that compares them to a normative database and the individual patients’ baseline. Alerts are sent to the physician’s office when significant changes from baseline are detected.